This is the weirdest fruit I've ever seen in my life. 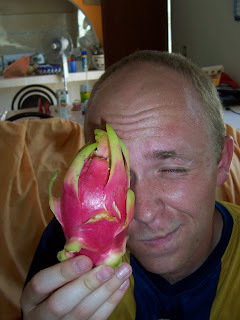 Jon and I ate it in Mexico--actually we made juice out of it. We bought it at the Mercado Rodante in Moralillo. Take a guess at what it's called... Answer is posted on my oldest blog. 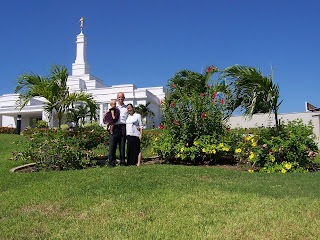 Our family on our latest big adventure to Tampico Mexico! 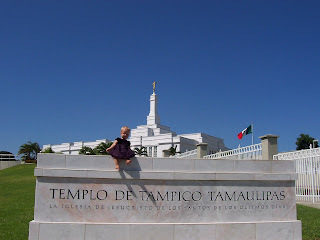 This is the beautiful Tampico temple and our eternal family! Dawna chillin' in front of the temple. Dawna loves to sing and sign songs. This is a less cute one, but we caught her in the right mood. Mom had all the grandkids learn the Family Tree song for our family reunion. This was Dawna's contribution. Other songs she enjoys are Popcorn popping, "Hands upon my head I place," and Pon Ponito (a little song we learned in Mexico). Adele is with Dawna in this movie Dancing with a puppy (mom's other grandkid). I"m in Antioch; We essentially bought a new computer today so I can have one at home. It looks the same, but it's been pretty much gutted and given better insides--new motherboard, processor, CPU, hard drive, and RAM. THis week we moved into my parent's house and a storage unit. I've been exhausted every day! I assume the pregnancy is coming along well... though I don't have a doctor yet (that is my goal for this week). I'm at 17 weeks and I've felt some movement, which is really fun! Dawna is almost running now... and might be able to out-run me soon... She is loving having Adele as a roommate. They have done really well sleeping in the same room. My mother-in-law helped y fix my sewing machine and we got started making a denim quilt from all the jeans I cant dream of fitting in anymore. Its been fun.